is an original piece created for the Hoffman Challenge 2004 and she traveled with the exhibit. The challenge fabric was a garishly bright butterfly fabric, so this was the theme that was brought forth throughout the design. 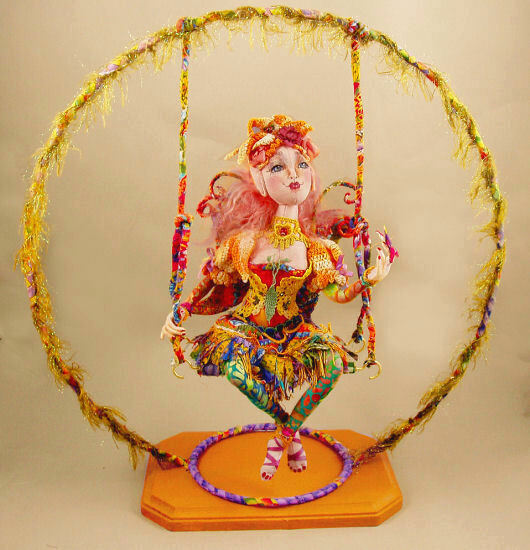 She is a 12" fairy seated on her own swing suspended from a wire hoop. 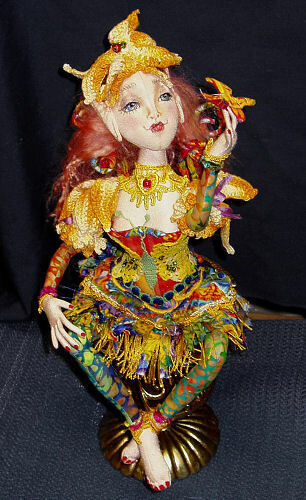 She has needle sculpted and painted features, and fabric eyelids. Her upper body, articulated hands, feet and head are from velour and the lower body, legs and arms are from contrasting cotton fabric. Her fringed skirt and wings are from the Hoffman Challenge fabric. FLUTTERBY is exquisitely detailed with hand dyed lace and crochet pieces, silk flowers and ribbon, trims and beaded here and there for accent. 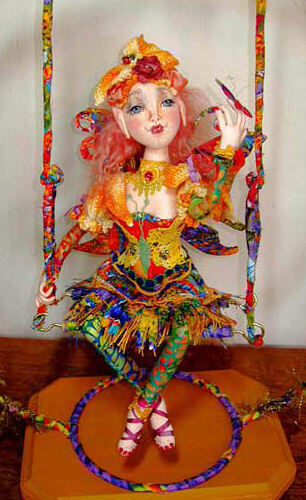 Her tiny fingernails and toenails are painted red, and her wings are fabric wrapped and shaped wire. The whole piece, which is permanently mounted on a wood base, is 17"